After the shocking loss of our beloved Choc. Lab Harley to lymphoma cancer my husband I set out to find the perfect GSD companion to fill the void in our life, hearts and home. After countless hours of research, speaking with breeders and more research we found Gretchen. Gretchen is my first German Shepherd and after only three full days with her I can't imagine what life was like before her. Gretchen is currently 10 weeks old; housebreaking has been a breeze with her. 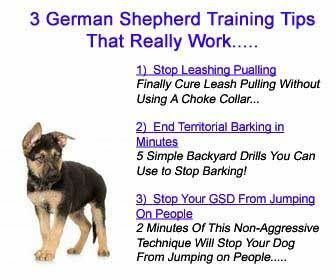 I have never in all my 44 years worked with a dog or pup of any age that was so eager to please and easy to train. The day we picked her up (Sat. July 10th, 2010), her breeder put her on the ground and she came running over to us just as fast as her little legs and big feet would carry her. She jumped into our arms with a big puppy grin on her face like she was saying.. "Your finally here!!" When it was time to leave, Gretchen followed us right to our car and never looked back. This photo of Gretchen was taken her first day at home. She is so proud looking and regal, I can't help but stare at her for hours on end in total disbelief over her. I'm looking forward to her puppy shots being completed so we can enroll in our puppy classes together. She is a love that is for sure. 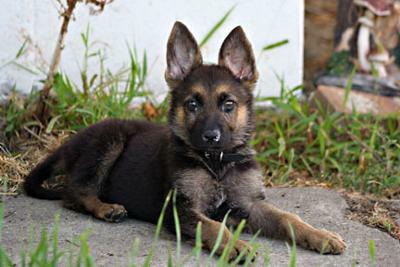 Beautiful GSD. You will never regret the decision to get a GSD. I cam promise you, you are headed for loyalty, protection, and endless unconditional love. God Bless you both and watch over you.